2 on 0 attacking series, then go 2 on 2 with defenders. 1 passes to coach, basket (speed) cuts, straddles the weakside lane line, then clears to the weakside wing, always seeing the ball. 2 replaces 1. - coach passes to 2 who drives for a layup. Sean Miller - 1 on 1 Vegas closeouts - add defender X1, who jumps to the ball on the pass to coach then gets to a help position. 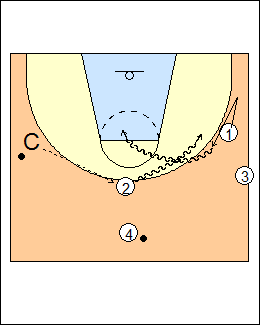 Canada Basketball - 1 passes, cuts to the basket (ballside), opens up, balances out to the weakside corner while looking for the ball (and will then blast cut). Don Kelbick - a) 1 gets a return pass from coach for a layup, b) coach passes to 2 filling the top, for a shot. See Tactics - Teaching 4-out motion. a) The ball is reversed to 1, who rips and attacks the basket, 1 and 2 switch lines. - 2 makes a return pass to 1 on the exit cut. Miller - X1 closes out on the pass to 1, it's live. See Layups - Eastman pass and replace, 4-out drive and kick, Shooting - Pivot kick. 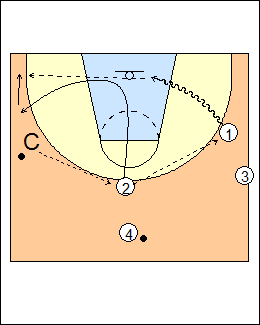 b) Coach passes to 2, 1 cuts backdoor for a pass from the top. c) 2 drives from the top, kicks it out to 1 for a shot. - live 2-on-2, coach is always open for a pass from the attackers. 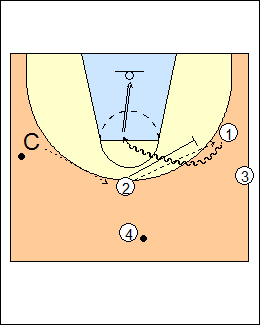 d) 2 passes to 1, basket cuts and clears weakside, 1 drives baseline and passes to 2 drifting baseline for a shot. 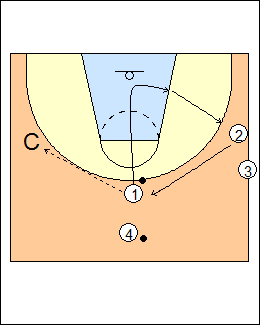 e) 2 passes to 1 and follows to ballscreen. See Attack/defend - Mike MacKay ballscreens, Fast-break ballscreens, Pick and drive. f) 2 dribbles at 1 for a hand-off. See Attack/defend - Pistol action, Shooting - Dribble handoffs. 1 passes to coach then 2 flarescreens for 1 (and goes opposite). 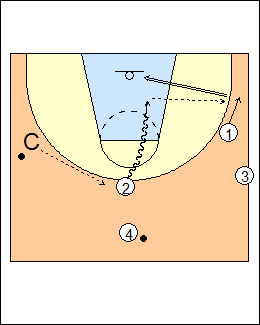 Kelbick - 1 screens for 2, a) 2 cuts towards the ball, 1 goes to the basket, 2 gets a pass, b) 1 gets the pass, c) 2 curl cuts the screen for a pass, 1 comes back high. See Attack/defend - Allison McNeill screening, Shooting - Bauer two-ball screening, Tactics - Bauer 4 on 2 motion.